« The Dining Room, again. Hanging pictures is the worst. Leaving aside my chronic indecision—which led me to punch the crumbling plaster in the Madison house full of holes in every possible configuration—I’m just plain bad at it. 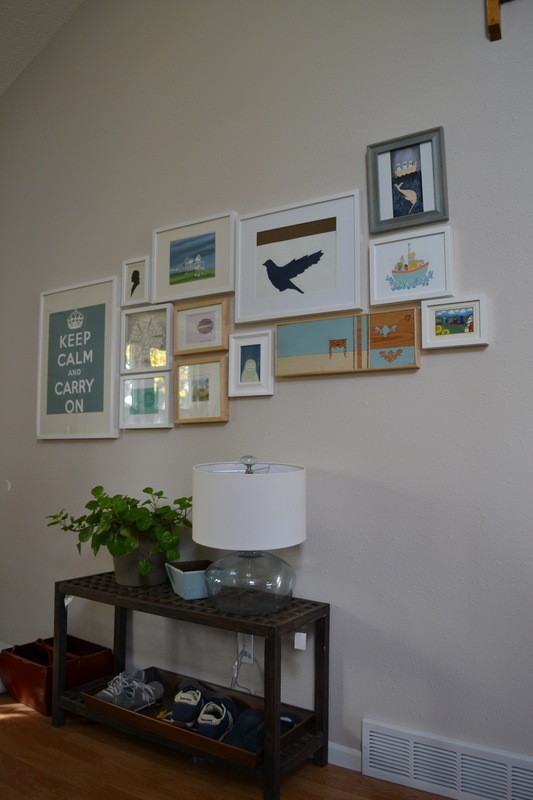 For several years, I’ve had three John Derian for Target prints. They’ve never been hung, and probably never will be—for the simple reason that the set of three means that they’d probably have to line up somehow, and I just can’t do straight lines. Eventually, in Madison, I settled for a small and non-linear collage featuring a piece of wrapping paper (printed with a map of London), a weird silhouette of George Washington that I got at an antique mall, a framed doily, and my now quite unfashionable “Keep Calm” poster. The blogosphere has moved on from those, but I don’t care. I like it. This is the other wall in the entry, directly across from the dining table. Everything looks short and squatty in there because the ceiling is two stories tall and I’m looking down from the landing. Here’s where we are now. I really, really need to buy some acid free tape so I can fix that drooping bird. But there you go, a look at how things really are. And have been for years. 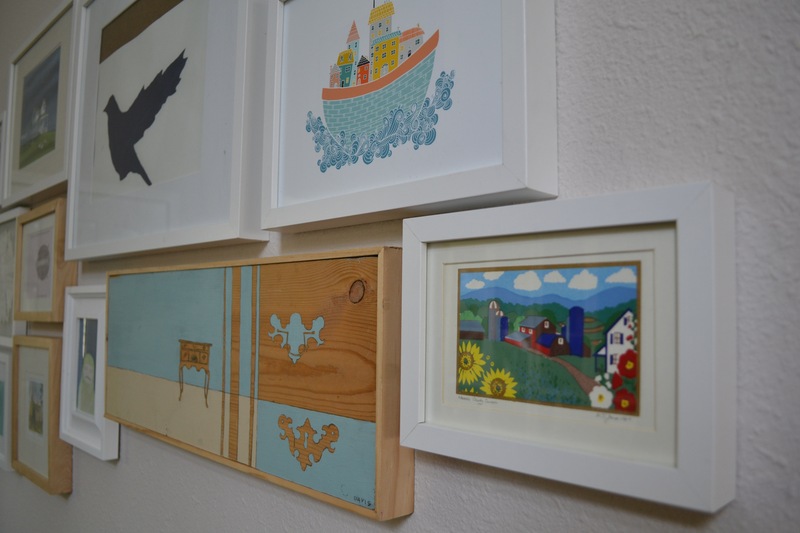 I already had all of these little bits of art; they were part of the ongoing rotation throughout the tiny walls of the Madison house. 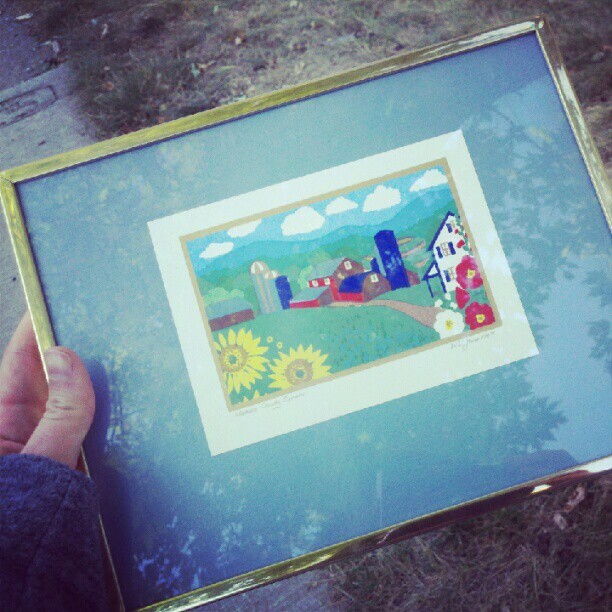 It’s my twenty-five cent yard sale print, collected on walk through Madison on my last visit. The blue matte (mat? Google can’t decide) was just the wrong shade. It reminded me of the kitchen wallpaper in the Colorado Springs house—sprinkled with cream flowers. Nostalgic, for sure, but not a good match for out lives now. So, when I got back to CO, I made a stop at Ikea on the way back from DIA. Well, it’s not on the way, but twenty minutes out of the way, and I barely made it out of Denver before the highway shut down for the presidential debate at DU. Oops. But now I have white frames! The best thing about this arrangement is that we can keep adding on without having to worry about straight lines at all. I already have a few more additions waiting in the wings—I finally cleared out the pit in our storage room, and found some bits of art down there. Along with many piles of dead spiders. And vestiges of my former affinity for shabby chic. i finally bought a level and i don’t regret it. I have a level! But especially in Madison, the walls were NOT LEVEL. learned that the hard way.